Sweet honey and powerful, belly-warming ginger combine to make this Japanese favorite that is bursting with flavor. Unlike chicken teriyaki, this dish adds a kick that is anything but ordinary, but absolutely delicious. 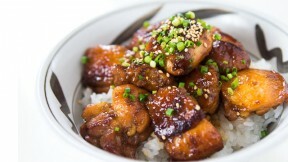 Marc Matsumoto of NoRecipes shares this Japanese chicken recipe in a full post at the Fresh Tastes Blog. Cut the chicken up into bite-sized pieces. In a bowl, whisk the soy sauce, sake, honey, and ginger together, then add the chicken. Marinate for at least 30 minutes. Heat a frying pan over medium heat until hot. Add the oil then swirl to coat. Fry the chicken in batches. You want to get a nice brown crust, so it’s important that the chicken is in a single layer and has some space between each piece. Because there is sugar in the marinade if your pan is too hot it will burn. If the pan is too cool, water will leach out of the chicken and it won’t brown. Adjust the heat accordingly. When the chicken is browned on one side, flip it over and brown the other side. Transfer the chicken to a plate. Once all your chicken is browned, use a paper towel to wipe out any extra oil, then add the remaining marinade to the pan along with 2 tablespoons of water. Bring the mixture to a boil over medium high heat, and then return all the chicken to the pan. Stir, until the liquid has mostly evaporated and the chicken has a nice shiny coating of sauce. Garnish with scallions and sesame seeds and serve over rice.